Sometimes, insight and healing emerge slowly during the course of our lives. 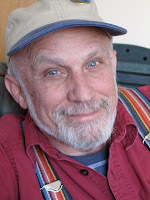 Like spring unfolding across the palette of April and May, our Practice deepens, and the world slowly greens and blooms. What was tan, stark, and frigid, slowly brightens, softens and warms. Green shoots appear. Buds opens. At a certain point we notice. Nothing has changed, yet everything has changed. It's different now than it was before. At other times, Zap! 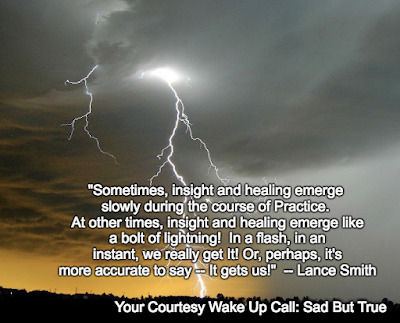 Insight and Healing emerge like a bolt of lightning! Sometimes, this bursts forth with a torrential downpour of tears. Sometimes not. Yet, in a heartbeat there is a Grand Gestalt. In a flash, in an instant, there is Crystalline Clarity. We really get It! Or perhaps -- more accurately-- It gets us. Everything has changed, but nothing has changed. Yet, it's different now than it was before. Awhile ago, I had the good fortunate to stop by Himalayan Views, a nearby spiritual gift shop/bookstore, to hear a woman describe one of those moments. She was sitting in the back reading area of the store, and as is often the case, I made the effort to say smile and hello. (A childhood rebel, I never agreed with "don't talk to strangers.") Soon, I found myself chatting with a her about the book she was reading, and comparing notes on our lives and spiritual practice. Her eyes were clear and kind. Her voice was gentle, yet powerful and strong, as she shared her story. She was in her mid-thirties at the time of her Awakening. Suffering from what had been diagnosed as "clinical depression," medicated since adolescence, she had come across a book of Pema Chodron's teachings. When she read of what Pema's teacher, Chogyam Trungpa had called "the genuine heart of sadness," her life was transformed. As the woman read that passage that day, Reality asserted itself. At that very moment, She knew. 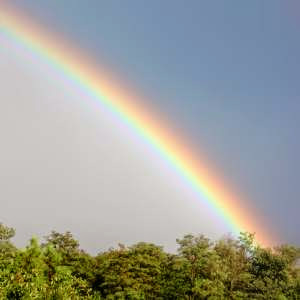 In a burst of tears -- and then with rainbows glistening through her tears -- the whole world shifted. She saw clearly that her experience of deep sadness about the human condition wasn't a sickness. It was an essential Connection to what the Buddhists call Bodhichitta, the soft and tender core of our Spiritual Heart. Like many of us, this woman had felt the power of a deep connection to the Mysterious Reality of Life and Death as a child, but nobody in her life knew what it was! Rather than receive acknowledgment, support, and guidance, she was told she had a chemical imbalance, a broken brain. Like so many people today, medication was presented as the only answer. And, as often happens for so many people, this fostered an even deeper disconnection from herself and others. Rather than receiving the support of a community that understood that we are Spiritual Beings, she suffered the stigma of "mental illness." As this woman read the teaching from Pema Chodron that day, the Connection was made. This precious and gentle soul now understood that her sadness wasn't a personal flaw. It wasn't an illness. Remembering her childhood Catholicism, she recalled that Jesus had said Blessed be those who mourn, for they shall be comforted. She now understood. It was a Blessing to feel her heart's sadness. That day, she knew that in her Heart of Hearts that she glimpsed what Buddha and Jesus, and countless other saints, sages, and seers had seen. She had touched the One Love. Now, she just needed to learn how to work with it. With the assistance of a supportive counselor, a regular meditation practice, and a supportive community of spiritual friends, this budding Bodhisattva decreased, and then completely discontinued, the use of the antidepressant medications she had been prescribed since adolescence. By the time she was sharing her story that day, this courageous and inspiring woman had been successfully, sometimes quite joyfully, navigating her life for over three years -- completely drug free. Please understand: My point here is not that medications are always the wrong approach. As a child of the sixties, how could I ever claim that drugs are always a bad thing? (Stephen Gaskin and Ram Dass weren't the only ones who experienced significant awakenings under their influence. LOL). Sometimes, medications can be helpful. Yet, each of us walks a unique path. There is no "one size fits all" path to healing. Over the years, I've had friends whose quality of life, at least for a time, has been improved through the use of prescription drugs to make their lives more manageable. Yet, I've also had many friends, who were like the woman I met that day. Their quality of life improved only when they stopped relying on medications. Drugs simply are what they are. In the world today, we desperately need people who have the courage to open their hearts and minds, to face reality as it is. As the mystic saints, seers and sages of all religions have seen throughout the ages, a Compassionate Heart is the Key to the Kingdom. Although we may first have to face and embrace the fear that shrouds true vulnerability, deep within and beyond our own personal sadness is the shared existential sadness that connects us to one another and to the One Love that pervades the universe. Rather than "harden our hearts" to life, we have the choice to soften, to open, to Love fully and completely. It is there that we find comfort and joy. Although it takes commitment, effort and patience, we can learn to embrace with understanding and skill that which we've been conditioned to avoid. With Practice, our own soft and tender heart becomes a gateway to fundamental fearlessness, boundless compassion -- and deep joy. Rather than stagger along with our minds clouded by our conditioning, repressing our feelings or acting out again and again, over time, we increasingly find ourselves living from our hearts. Allowing ourselves to feel deep sadness, we are able to feel deep joy. In special moments, we may even find ourselves dancing freely, like dandelion seeds glistening in the sun, sailing within the infinite expanse of the One Love. Originally posted April 18, 2014. Revised and updated. Sadness seems to be on my plate these days. Thank you for this blog. As the saying goes, "It happens in 3's" . I have lost 3 very very dear friends in less than 4 months. Letting go, grieving and helping those left behind, including myself, has been such a pendulum of emotions. I'm sad to no longer have these people in my life here, yet so thankful to have had them pass through my life and actually be able to see how they 'passed' this classroom in their own lessons learned. Tears through joy is the only way I can get through this right now. I still have yet another to leave in a week, if I don't leave first. Meditation, peace, trust, and knowing nothing is wrong, reality is what it is. Always Maintain a Joyful MInd! ?